Added autoscrolling for left/right behavior. Should be updated in the archives whenever an admin has a chance. I can take care of the editor since it's available. But could you update the program on TI-Planet, so that players won't have to wait for Cemetech admins ? Thank you very much. It's a great Christmas present for all of us. Thank you Mateo! Sorry I wasn't stalking Oiram CE forums all day for the past few days (I don't do it btw hehe) or I would have noticed sooner. I heard you had finals soon (Or are they in the future?) and I hope you are or are going to do well on them. 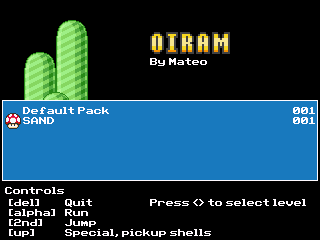 Please fix my Oiram pack!